CNFA is currently hosting a national contest for the chance to win consumer (family) fireworks prize packs worth $500! Contestants are entered by sharing photos of fireworks celebrations on their social media pages by using the hashtag #CelebratewithCNFA. Anyone can enter at any time until Canada Day 2018. There are four prize packs to be won overall, and each winner is chosen seasonally by random draw. This is a great contest you can share with your customers, family and friends. CNFA is also hosting a retailer contest. 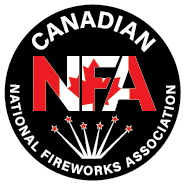 The fireworks retailer who signs up the highest number of new CNFA members will win $5000 worth of family fireworks. Every retailer who signs up at least 25 new members are entered in for a secondary prize of $1000 worth of family fireworks. New members must include their retailers’ contact information in the “Referral” section of the application for retailers to be entered in the contest. Congratulations to the first of four #CelebrateWithCNFA prize pack winners, Rachel Duke! CNFA will have a featured editorial piece in The Alberta Fire Chiefs Association bi-annual magazine, The Responder, available February of this year!